Orange_Plastic_Envelopes_with_Elastic_Closure is rated 5.0 out of 5 by 2. Rated 5 out of 5 by Nelia Santos from Very good product Everything what I wanted. Size, color, it is what I needed to file documents for my clients. Rated 5 out of 5 by Hud59 from Really nice large file holders. We bought these to replace the older cardboard file holders that we use for transport for files from our shipyard to our main office. They look and work great, and they're also water resistant for those rainy days. Do these have pockets?how many pockets? It is just one envelope. There are no additional pockets. Welcome to the OC! Welcome to these Orange Containers that is. Whether you're looking for luxury like the Californian Orange County or want something practical, these Orange Plastic Envelopes with Elastic Closure combine the two! The vibrancy of the orange color and the practicality of the plastic will bring your style up ten notches. So much so that you'll definitely fit in when you arrive at Laguna Beach. 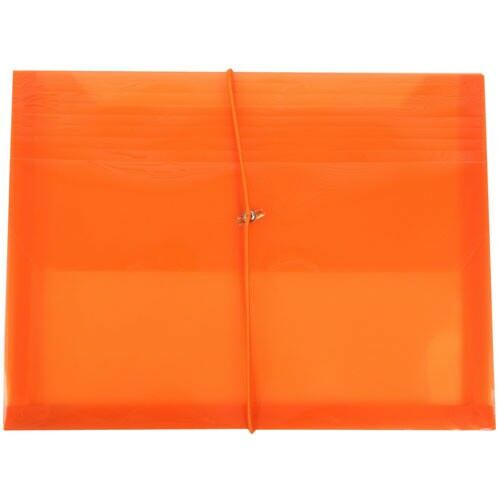 These Orange 9.75 x 13 Envelopes are great for storing all of your documents, whether it's for your papers for school or presentations for work or even arts & crafts for home. The plastic material attached to these Orange Letter Booklet Envelopes is as durable as it gets, so you won't have to ever worry about anything harming your documents. And the elastic closure is great for keeping everything intact. Along with these awesome features is the amazing 2 5/8 expansion! It's the biggest we have, so you can store the most you have! Orange Plastic Envelopes with Elastic Closure are available in Letter Booklet (9 3/4 x 13 x 2 5/8).